Between the early 1960s and 1975, Cambodia was home to a vibrant film industry that produced more than 400 features. When the Khmer Rouge seized control of the country, they halted production, demolishing the industry along most of the rest of the country's cultural life. Cinemas were closed, prints destroyed, and the filmmakers, actors, and screenwriters who were not able to flee the country were slaughtered. Davy Chou's GOLDEN SLUMBERS resurrects this cinema's heyday. Though very few of the films from this period have remained intact, Chou uses the soundtracks, advertisements, posters and lobby cards to recreate his subjects' shared memories of a golden era. 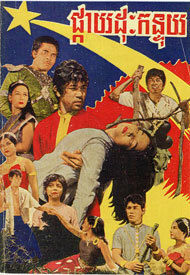 The film contains interviews with the era's surviving artists, including directors Ly Bun Yim, Ly You Sreang, and Yvon Hem, and actor Dy Saveth. Two dedicated cinephiles-one of whom says he can remember the faces of film stars better than those of his brothers and sisters-recall plotlines and trade film trivia. Chou also takes us inside Phnom Penh's shuttered movie palaces, now transformed into karaoke bars, restaurants, and squats. These reminiscences and recreations testify that while the most of the films of this era have vanished, their memory endures for an entire generation of Cambodians, leaving a complex legacy for today's youth to inherit. A UN-appointed court tracks down those responsible for the crimes committed under the Khmer Rouge.